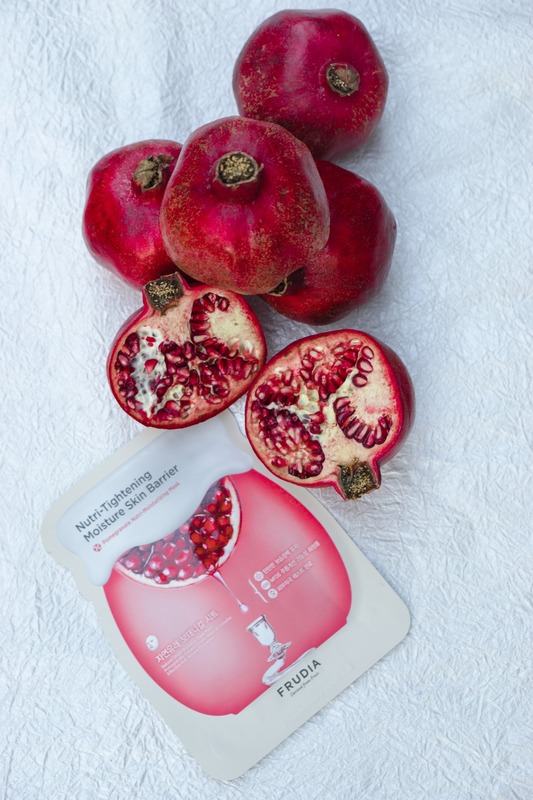 Did you know that pomegranate can work wonders for your skin? This incredible ingredient contains so many antioxidants and delivers so many beauty benefits to your skin that you MUST think about introducing it into your skincare routine! 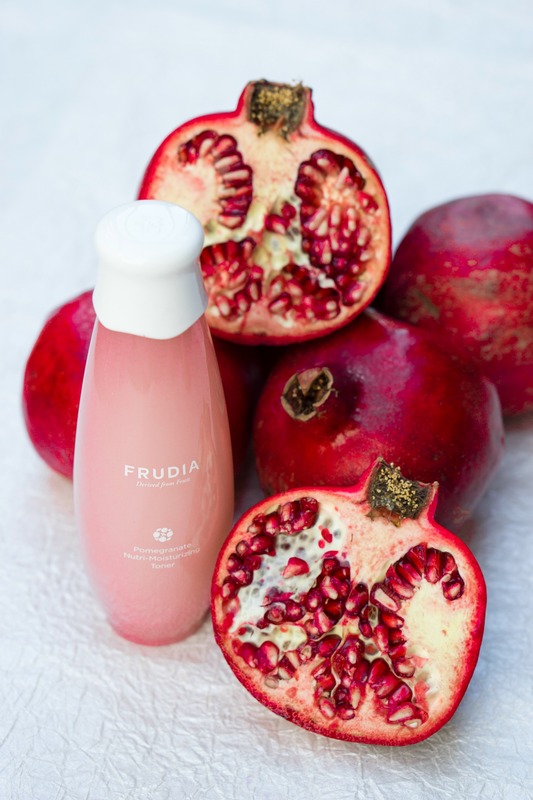 Today I collaborate with Frudia, a newly launched high-tech Korean skincare brand (it’s available at CVS, Peach and Lily, and FrudiaUSA.com) to talk about the benefits of using pomegranate internally and externally to improve the texture and appearance of your skin. Let’s start on a geeky side. Pomegranates are rich in something called punicic acid which is an ingredient known for its moisturizing properties. Punicic acid hydrates skin and prevents moisture loss. Why pomegranate is so incredibly effective when it comes to skincare is because it features small molecular structure which enables all the good stuff from this multi-seed berry to penetrate deeply into the skin, creating an ideal scenario for treating dry skin. 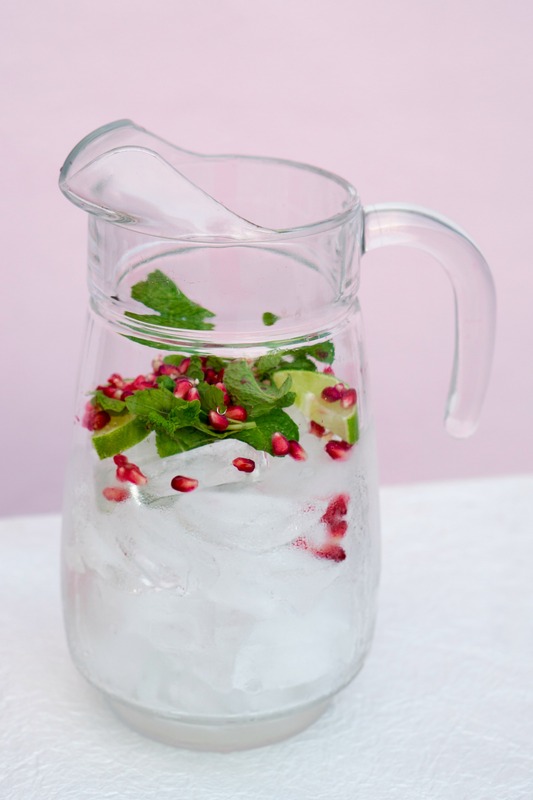 It’s important to mention though is that pomegranate is not only good for dehydrated skin. A combination and oily skin types could benefit from this berry too as its active ingredients help to balance any skin type. 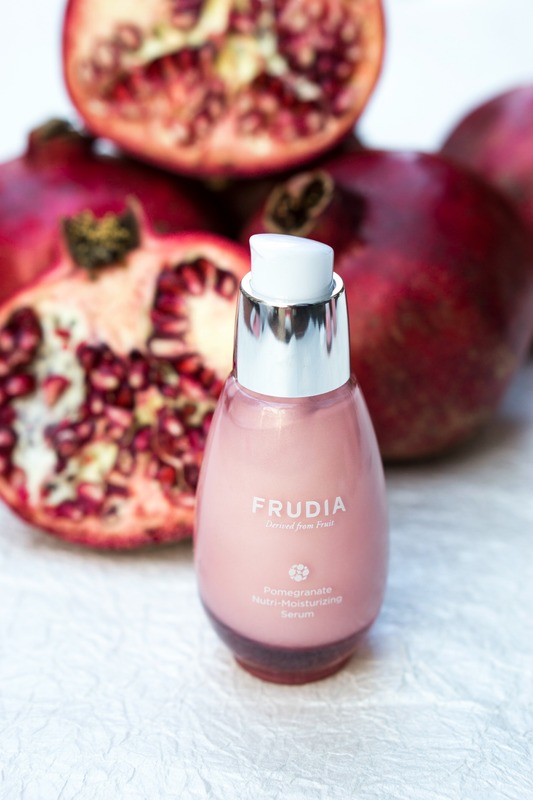 One of my favorite skincare lines featuring pomegranate is Frudia Nutri-Moisturizing Antioxidant Power. I like it because all of the four products in the line are featuring a high percentage of natural pomegranate extract. Think about it this way: most of the skincare lines you could find in the stores contains water or glycerin as number one ingredient, while Frudia is known for having natural fruit extract as the most active ingredient listed. It means that all of the good stuff pomegranate contains is delivered in the highest concentration possible — to ensure that your skin receives all the nutrients and antioxidants needed. 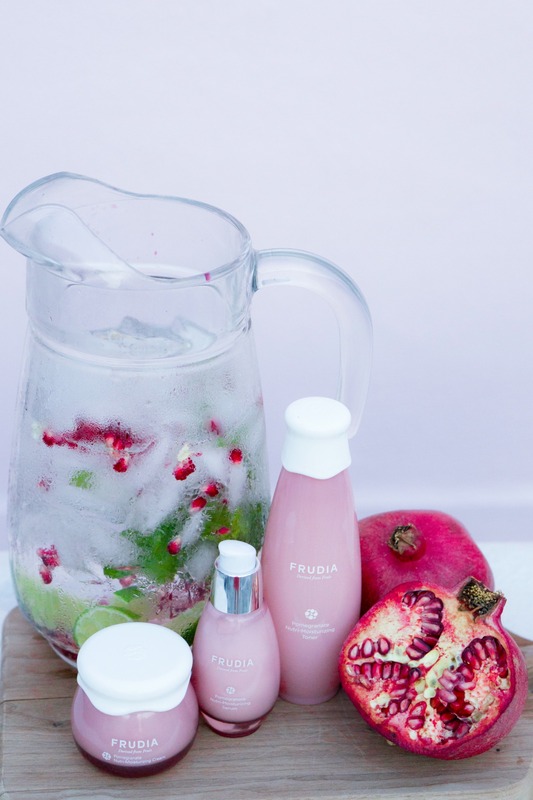 I use products from Frudia’s Pomegranate line when I feel that my skin is super dry and dehydrated, which usually happens after swimming and being in the sun all day long. While it’s hard to stick to just one skincare routine when you are a beauty blogger, I have Frudia Pomegranate Nutri-Moisturizing Toner in my beauty room at all times as this uniquely thick toner provides immediate hydration and makes my skin feel so soft. I have a combination skin with periodical breakouts, so this toner helps to hydrate my skin without clogging my pores. You probably know that you have to moisturize your skin even if your skin type is a combination, and this toner is the exact solution my skin needs as it’s super hydrating, but doesn’t feel heavy or uncomfortable on my skin. 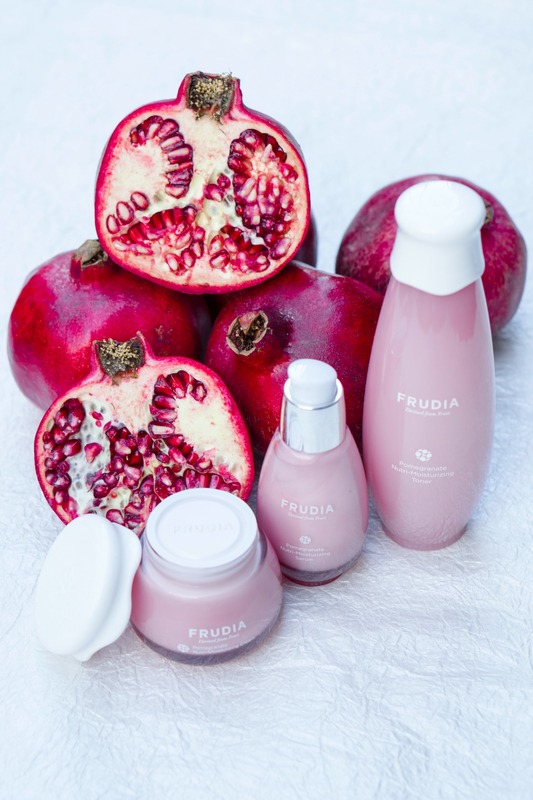 I recently wrote about Frudia’s Blueberry Line and I feel that the cream and serum from that line provide a similar effect, with the difference that the pomegranate line is also providing anti-aging benefits. 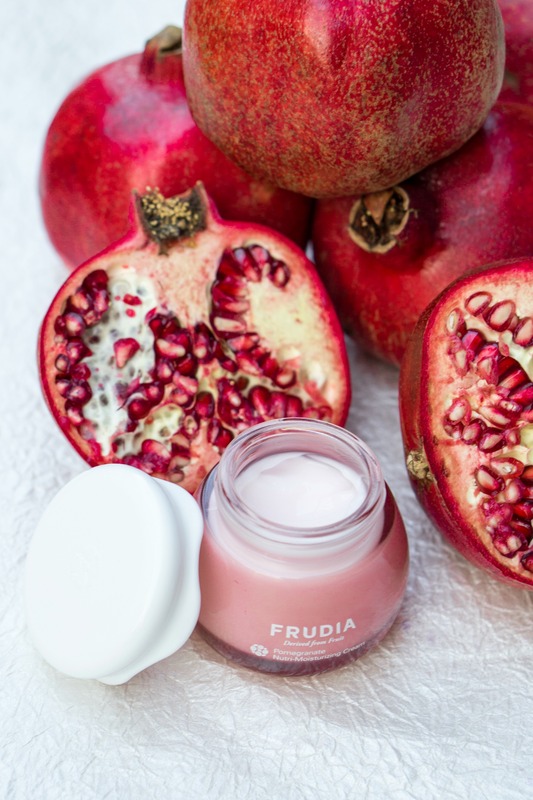 I’m in my 30th and I can’t resist testing products that feature anti-aging ingredients and I loved how my skin felt after testing products from Frudia’s Pomegranate Line. This product features a lightweight formula that is so easy and pleasant to work with. It momentarily absorbs into skin and immediately makes it feel more hydrated and plump. I especially love applying this product on my decollete as it’s one of the areas that I tend to forget. With the help of Pomegranate Serum, I’m able to quickly restore the hydration level of my skin even if I neglected applying moisturizer on this area for a few days. This cream finishes the deep hydration regimen as it literally locks all the good ingredients in your skin to ensure proper absorption. I especially love using this cream during the day when I’m planning on creating a dewy foundation look. I personally noticed that super hydrating cream immediately makes skin look better so these days I often times moisturize my skin twice. First, after I wash my skin in the morning and then right before applying makeup. This trick really works for my skin — I wonder if you are using the same skin nourishing tactic? This mask is my absolute favorite. You know how diligent I am when it comes to applying face masks and this nourishing mask did pass the test! It’s so gentle and so hydrating — I couldn’t believe such results are possible for such affordable price. I already used the mask twice and I’m saving my last one for a special occasion when my skin needs to look particularly good. In other words, the Pomegranate Line is getting thumbs up from me as it’s a great affordable line to check out if you have aging and dryness concerns. Pomegranate contains 15 different antioxidants which make it one of the healthiest fruits (I mean, multi-seed berries) out there. People in Russia, for instance, believe that pomegranate is the most valuable for detoxing your body from toxins. Especially, if you drink organic pomegranate juice regularly. Such type of juice is also known to help to prevent heart disease and other illnesses. It doesn’t mean that you should stop using the benefits of pomegranates if you have no problems with your health at all as pomegranate juice is believed to improve the immune system which means less cold and flu incidents during the cold season. Direction: This SPA water recipe is super easy to repeat. First, you need to seed the pomegranate and put the seeds into a jug. Then, slice and add the lime (it’s up to you, whether you want to keep or get rid of the skin). Finally, add mint leaves and loads of ice. Top everything with water and enjoy! A few words on how to choose a perfect pomegranate. The most important thing is that pomegranate should feel heavy. If it weighs heavier than it looks like, it means that the seeds inside of pomegranate are ripened. The skin should look dry and do not contain any stains or holes in it. The golden rule of picking a great pomegranate is when you could feel the seeds through the skin. That was it with my thought on the benefits of pomegranates for your beauty and health. I hope you enjoyed it! If so, please let me know if you ever tried a beauty product that contains the pomegranate extract. What was the product and how did you like it?